Fake degree certificates of Bangalore University are flooding Mangalore and northern parts of Kerala. STOI has managed to get one such fake BA degree certificate and marks cards of Bangalore University through a source. 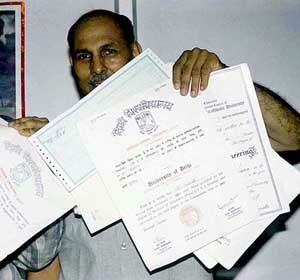 It’s suspected that the fake certificate is being used by a person in Kerala. The degree in History, Economics and Political Science indicates there’s a racket at work in this region. When this reporter sent details of the certificate to Bangalore University, it was revealed that the certificate is a fake. The university clarified in its reply that the register number and name mentioned in the certificate do not exist in its records. “The xerox copies of the marks cards of Sri Vishal K (name changed) bearing Reg No. 03BGA01066 for BA Degree Course submitted by you for verification are verified with the relevant registers maintained at our office and is found that the Register No. does not exist in the registers. Hence, the candidate may be informed to submit the original marks cards for further course of action,” the office of the registrar (evaluation) of Bangalore University clarified in its letter on September 3.